According to that noble garnering of human knowledge, the Urban Dictionary website, an event which isn't recorded by copious photographs didn't really happen. I'm going to have to insist that the Oceania issue of brief was launched at the Onehunga Workingman's Club last Saturday night, despite having a paucity of images to support my claim. If their memories aren't too badly affected by a very strong batch of Tongan kava, then the forty-odd punters who turned out for the event should back me up. I thought I had the documentation of the launch party organised, but the estimable Jack and Bronwyn, who were going to supply high-quality photos, succumbed to the flu on Saturday, and Paul Janman, who was supposed to shoot some moving images, got mobbed by guests enquiring after tickets to his festival-bound film Tongan Ark, and Skyler, who was carrying a modest camera in her handbag, was often busy attending to the whims of our three month old baby. Skyler did manage to snap a rather fetching image of Michael Horowitz, the sociologist and novelist who is a former Director of Tonga's 'Atenisi University and current chancellor of its fledgling Vava'u Academy, showing off his new tala'ofa to the guests at the Workingman's Club. Along with Sisi'uno Helu, the current Director of 'Atenisi and daughter of the institution's legendary founder Futa Helu, Horowitz flew down from Nuku'alofa especially for the launch of the Oceania issue of brief. Horowitz's speech at last Saturday night's party celebrated the fact that brief has opened its doors to writers and thinkers from the 'Atenisian tradition, and to other intellectuals from the tropical Pacific. Murray Edmond's forty year career as a poet, playwright, and critic may make him one of the grand old men of New Zealand literature, but he still has more energy, more imagination, and a lot more hair than writers decades younger than him. As Murray followed Horowitz into the spotlight and recited his classic poem 'Von Tempsky's Dance' I gazed enviously at his fine ungreying mane. In an essay published in the new issue of brief, Murray explains that 'Von Tempsky's Dance' was inspired by the visions of New Zealand and Pacific history he had as a young man living amongst revolutionary students and drugged-up Jimi Hendrix lookalikes in a grotty Grafton flat in the early 1970s. As Horowitz and Edmond addressed the audience, the band led by Futa Helu's son Niulala was tuning up the guitars and pouring out the kava. Niulala is an expert on Tongan dance and song, and his band performs on a weekly basis at kava circles around Auckland. 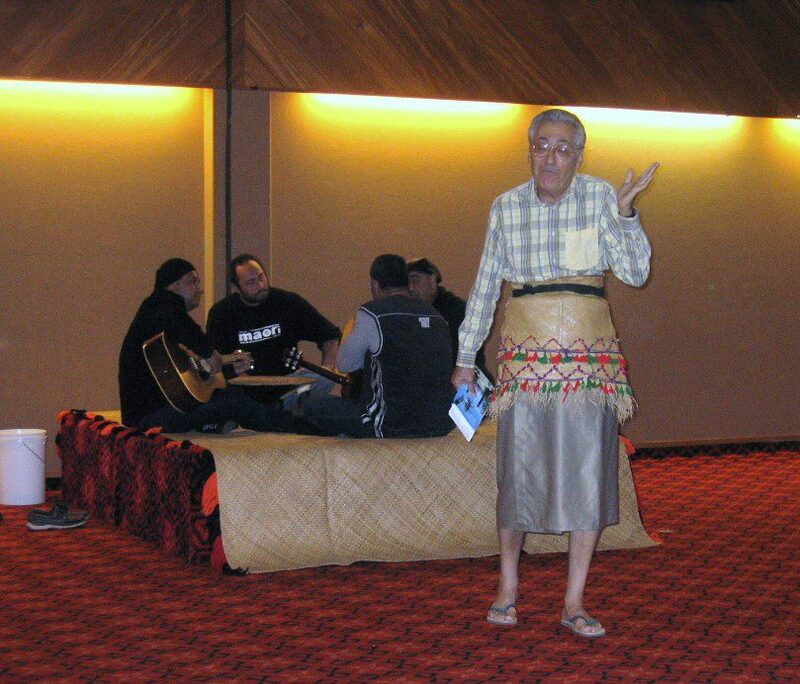 When the music began some of the audience headed for the kava bowl at Niualala's feet, while others wandered over to a corner of the room, where fragments of Janman's Tongan Ark were playing on a large screen. I kept an eye on the staircase which connected the kitchen of the Workingman's Club with its function rooms, and pounced when a couple of blokes in white emerged bearing huge plates of squid rings and sausage rolls. As I poured tomato sauce furiously onto my plate I noticed Hugh Laracy, Emeritus Professor of Pacific History at the University of Auckland, standing beside me at the serving table and harvesting a few of the squid I had left behind. 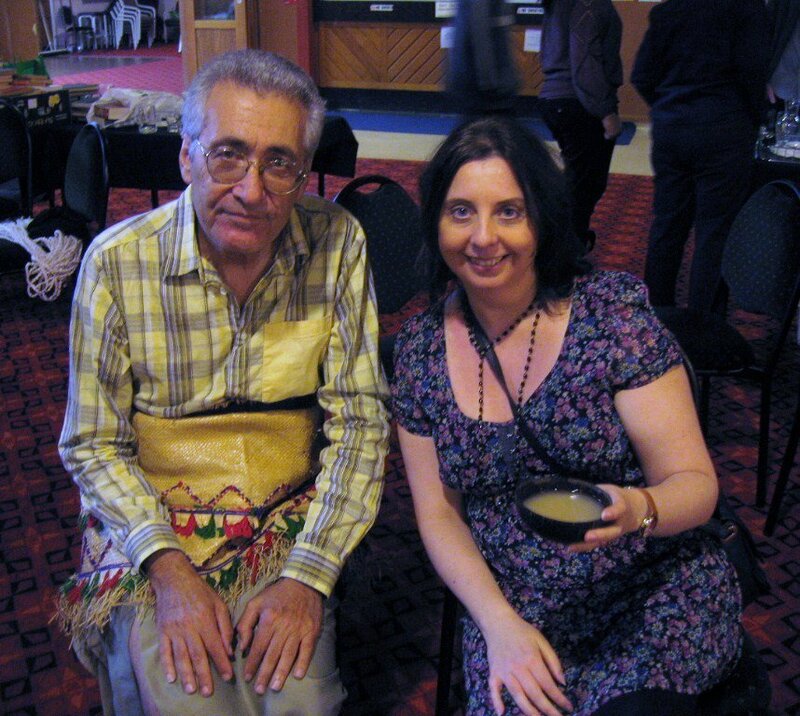 Laracy was a longtime friend of Kendrick Smithyman, and in the 1970s he and the great poet were part of a loose circle which shared the excitement of exploring Kiwi and Pacific history. People who knew Smithyman describe him as an indefatigable storyteller with a taste for strange anecdotes, and Hugh Laracy seemed to have the same qualities. After I'd told him I'd spent some time on the high island of 'Eua, Laracy launched into the story of a Canterbury sheepfarmer who moved his three thousand stock north to 'Eua near the end of the nineteenth century. After Tonga's King George the second tried to tax the earnings he was making on his herd, the farmer apparently went out to his pasture with his dogs, mustered his sheep, and drove all of the unfortunate animals over a cliff into the deep and wild waters around the island. As Hugh Laracy told one tall and true tale after another, I was reminded of a book reviewer's description of the nonagenarian British historian Eric Hobsbawm as 'a walking research library'. Later in the evening I chatted with Sefita Hao'uli, another man with an arsenal of fascinating stories. Hao'uli grew up on Foa, the home island of Futa Helu in Tonga's isolated Ha'apai archipelago, before following Futa to boarding school in Nuku'alofa. He remembers Helu as a young nonconformist, who baffled and intrigued his countrymen by quoting Heraclitus and Plato at kava circles, and by talking about the necessity of critical thinking and ruthless criticism to a healthy society. Hao'uli returns regularly to Foa, and I asked him about the petroglyphs which were discovered on the island late in 2008, after a storm ripped tonnes of sand off one of its beaches and left ancient stone exposed. 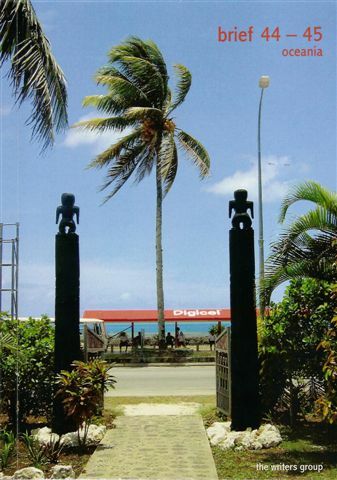 With their simple forms and fluid lines, the Foa carvings resemble the art of eastern Polynesian societies like Rapa Nui and Rekohu rather than the western Polynesian aesthetic of Tonga. 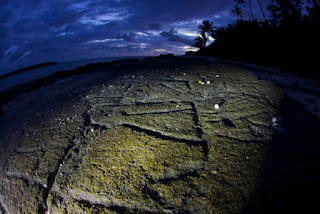 Archaeologist David Burley, who has been excavating Tongan beaches, fields, and forests for decades, hurried to view the petroglyphs, and decided that they were probably made by Hawaiian sojourners on Foa, and were thus evidence of ancient contacts between distant parts of Polynesia. Footnote: I forgot to mention the collection of books for 'Atenisi which took place at last Saturday's launch. I'll post about the results of our book drive later: right now, baby duties call! Did any brown people turn up apart from themyouhired to dance for you? Hard to sure, anon - they might have been white guys with shoe polish on their faces. And brief is far too poor to pay people to dance. If you'd come along, gotten a copy of brief, read the work of some of the 'Atenisian scholars and perhaps chatted with a few of them, then you might have noticed that one of their themes is the need to challenge hard and fast dichotomies between black and white, Polynesian and European. They don't see why they can't study Greek, sing opera in Italian, and dance the lakalaka. As Helu himself famously said, 'we here in Tonga think that blacks are too black, and whites are too white, whereas we are a mellow shade of brown'. Perhaps you could learn something from his tolerance and from his sense of adventure. A deportee arriving in Tonga on a private aircraft from Australia last week was escorted by police officers, and reportedly in handcuffs, when he disembarked at Fua'amotu International Airport on May 22, before he became a free man. The Acting Police Commissioner Taniela Faletau, said the information he had received was that the Tongan man, was deported from Australia to Tonga on immigration matters. He said that Australia has a policy that upholds the privacy of these individuals and they respected that. "But since he is now in Tonga, he is a free man, and the police do not have any power to detain him. The police will only gather information on whether he has any family in Tonga and we are working with other groups like churches and the private sector to assist him in restarting his life in Tonga," he said. He said that some people at the airport were intrigued to see the man escorted to Tonga on a private aircraft by police officers, "but that is standard procedure for Australia," he said. Included is a live performance by the 'Atenisi Foundation for Performing Arts and a free panel discussion, performance and drinks at the Civic Wintergarden afterwards. Tickets go on sale this Friday. Discounted group bookings are available.